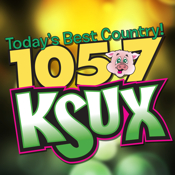 KSUX 105.7 is Siouxland’s home for Today’s Best Country. KSUX was launched in 1990 and has been your go to source for hearing the very best in country. The Tony & Candice morning show starts your day with entertainment, news with Charlie Stone and a guarantee for fun. Josie Cooper is the keeper of the midday office mojo and the highly regarded “Cooper Quiz”. Jackson will definitely get you home from work in style with offbeat news and the driveaway Triple Play at 5pm. Ryan Andrews keeps ya company at night. Thanks for choosing the KSUX app.